At TCOTC, our training is often fun and games. You and your dog having fun together helps to build a great relationship. Even better, our games are designed to teach your dog important behaviors that can help them successfully navigate common situations at home and in the outside world. For example, in our photo, the dogs are learning how to have a safe and comfortable encounter with an unfamiliar dog and person. Training your dog to be a good citizen whether at home or elsewhere is one of the best ways to keep them safe. Our Puppy Socialization and Basic Obedience classes teach members how to handle their dogs from the time they arrive at TCOTC to the time they leave. We offer separate entrance and exit doors and our instructors encourage students to keep their dogs close and focused on them when passing in the lobby and in the training ring. “We work on not only training our dogs and handlers on safety in the ring, but feeling safe as well. Both dogs and humans need to feel safe in order to learn,” says Jane Jacobson. Safety also comes to mind when we think of dog sports such as agility or flyball. These sports are fast-paced athletics. TCOTC training is designed to reduce the risk of injury to pets and their handlers, not only during class but in practice and competition as well. Anyone who has participated in a dog sports class at TCOTC has seen the emphasis our instructors put on building safety into the training. They work patiently with dogs and their handlers to build confidence and skill before the team takes on new equipment or athletic challenges. Basic Obedience and at least one Tier 2 class is required of all participants to ensure that dogs are controllable off-leash and comfortable around unfamiliar dogs and people. Members and their dogs develop solid foundational skills in beginning classes before moving to advanced levels. At heart, we at TCOTC want to help our members’ pets to lead long, healthy and happy lives. We offer classes and activities that keep dogs physically active and engaged at every age. And we offer members periodic education on pet health issues through seminars and online resources. 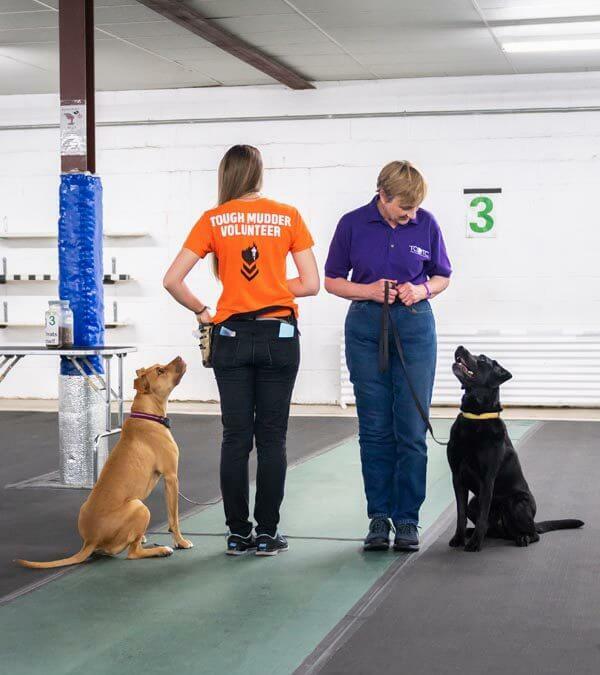 This photo, illustrating one of our TCOTC core values, Safety, features TCOTC member Hannah Schewe and her dog Cassie, with Jane Jacobson, TCOTC member, Instructor and Department Head Obedience and Flyball with her dog Lily. Cassie and Lily have this game down cold. Start walking, keep your attention on your mom. When she gives the signal, pop into your best sit. Guaranteed treat. Don’t worry about the other dog. Keep your attention on your mom, highly likely you get another treat.